Italian Prime Minister Silvio Berlusconi is to go back on trial in November, accused of tax fraud. It follows a recent decision by Italy's highest court to lift his immunity from prosecution while serving in office. He is to stand trial on 16 November - much earlier than expected - on charges linked to the purchase of TV and film rights by his family company, Mediaset. Mr Berlusconi denies the charges. He also faces another trial, yet to be set, for bribing a British tax lawyer. 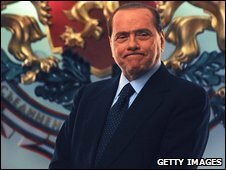 Mr Berlusconi had been facing two separate trials last year, before a law was passed giving him immunity while he was in office. Now that has been lifted by Italy's Constitutional Court, he will go back on trial. The first case involves allegations of tax fraud surrounding Mediaset. A second trial, where he is accused of bribing British tax lawyer David Mills, has not yet been rescheduled. The prime minister recently revealed that he has been involved in 2,500 court cases in his long, controversial career. He does not usually appear in court himself, leaving it to his lawyers to argue the cases for him. Even if he is convicted, there is a long appeals procedure and a statute of limitations which may cut proceedings short. Political analysts say if Mr Berlusconi is found guilty, that would not necessarily mean he would have to resign. But being a convicted, serving prime minister may provide Mr Berlusconi with additional political pressures, to go along with his recent raft of personal scandals.